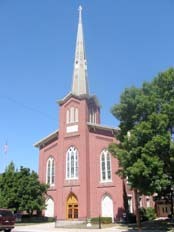 St. Jacob Lutheran Church has been serving the Miamisburg community since 1821. Even though we are 198 years old in a 154 year old building, we are getting better with age thanks to the wonderful guidance and grace of our Lord and Savior Jesus the Christ. We have worship services each Sunday at 10:30am (with organ) and noon (with guitar). Our Sunday School begins at 9:00am. Please browse our Web site for more information about St Jacob Lutheran Church. If you have questions, please e-mail us at webmaster@stjacob.net or call us at 937-866-4324. St. Jacob Lutheran trivia in Miamisburg Did you know the following places in Miamisburg are named after St. Jacob members? We know you have been on Heincke Road. That is named after one of St. Jacob’s first pastors. He had a farm on that road. Other streets named after our folks include Zeck Road, Benner Road and Kercher Street. Larry Benner was our world traveling clown/musician and Lawrence Avenue is named after him. We play sports at Rice Field. That is named after long time members. Bechler Field also has the name of SJ folks. Bauer Elementary School is named after a very faithful St. Jacob woman by the name of Levita Bauer. Did you know our church bell was cast in 1832? It did not have a very pleasing sound with the first cast, so the story goes that many St. Jacob folks brought in silver utensils and silver coins to improve it. The bell was recast and the extra silver did the trick. The bell has been ringing true and clear for nearly two centuries. By the way, the name of our city is spelled in an unusual way on the bell - MIAMIESBURG!!! the bells of St. Jacob ring loud and clear. for the bells ring out in a special way. They tell when it’s quarter, half or hour. A timely reminder of God’s holy power. Those bells were paid for by donation. Just hearing them brings much elation. that rings out clearly to God above. over an evening breeze, loud and clear. and bring us memories that are so sweet.